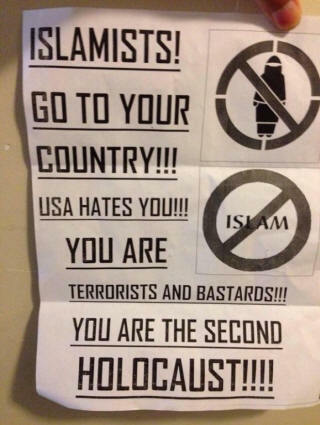 Islamophobia is reaching alarming levels in the United States. There have been 80 attacks on mosques in the past year, according to the Council on American-Islamic Relations (CAIR). Two were firebombed in California and fire damaged a future mosque in Daytona Beach. Other mosques had a pig's head left at the door or were defaced. "There has been a tremendous rise in bullying. More than half of Muslim students in one study reported faith-based bullying," said Ibrahim Hooper of CAIR. "The level of fear and apprehension is worse than I have ever seen it in my 30 years here." "Trump has been the main factor putting anti-Muslim hate into the mainstream in a form that it is pseudo-patriotic to express hostility toward Muslims and it is really a frightening phenomenon," he added. He says Muslims are seriously asking, "Will we be kicked out of the country if Trump gets in." President Obama referred to this rising hostility toward Muslims in his final State of the Union: "When politicians insult Muslims, whether abroad or our fellow citizens, when a mosque is vandalized or a kid is called names, that doesn't make us safer," he asserted. "That's not telling it like it is. It's just wrong. It diminishes us in the eyes of the world. It makes It harder to achieve our goals. It betrays who we are as a country." The Arab American News thanked Obama for his "strongly worded defense of the Muslim community against bigotry...His words come at a critical time for our nation and community. Muslim and Arab Americans have become proverbial punching bags for right wing politicians who want to appeal to their fanatically xenophobic base." However, the newspaper's editorial reminded the President that "actions matter more than words... Obama failed to reform the ridiculous No-Fly list which robs - mostly Muslim-Americans of the freedom to enjoy air travel." That is another form of Islamophobia. After the Paris and San Bernardino killings by Muslims, American fear of Muslim extremism is rising and is understandable. The FBI says it is monitoring the activities of 500 militant Muslims who are in every state. I welcome that. And I disagree with this criticism by the Arab American News: "Spying on Muslim communities under dubious programs such as Countering Violent Extremism, actually became more prominent during Obama's tenure." We need to uncover plots by Muslim extremists to kill Americans. The Islamic State, or ISIS, is persecuting and killing Christians who won't convert to Islam. More than 125,000 Christians - men, women and children - have been forced from their homes in such cities as Mosul where Christians have lived for 2,000 years in one of the world's oldest Christian communities. Some of those ISIS killers are Americans who were attracted by the militant sect. There is a legitimate fear that some of those killers will come home to follow the San Bernardino massacre model - or that of the Boston Marathon. However, tiny numbers of America's 2.75 million Muslims are attracted by terrorism. The FBI is doing a good job protecting us. Can you think of any recent Muslim-sparked violence in America other than San Bernardino and Boston? On the other hand, can you think of a single Catholic or Methodist bishop or a state Baptist president who has denounced the Islamophobia that is popping up in every state? I cannot. What fueling this rising hostility toward American Muslims is Donald Trump's call for a "total and complete shutdown of Muslims entering the United States." His Republican opponents denounced his proposal. New Jersey Gov. Chris Christi charged, "This is the kind of thing that people say when they have no experience and don't know what they are talking about...We need to cooperate with peaceful Muslims who want to give intelligence against those who are radicalized." Jeb Bush called him "unhinged." Ohio Gov. John Kasich said, "This is just more of the outrageous divisiveness that characterizes his every breath and another reason why he is entirely unsuited to lead the United States." During the Democratic Town Hall debate Monday night, a Muslim American Air Force veteran asked if the United States is the best place to raise her children, given the reality of increased Islamophobia in the country. Hillary Clinton replied, "I found it particularly harmful the way he has talked about Muslims - American Muslims...It is not only shameful and contrary to our values to say that people of a certain religion should not come to this country; I think it is dangerous." One more reason Republicans should nominate someone else. Copyright (c) Michael J. McManus, President of Marriage Savers and a syndicated columnist.